I said that I wanted to do more posts about Duncan Jones, so here is one! 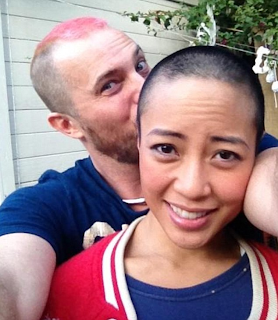 Duncan Jones was dating photographer Rodene Ronquillo when he discovered a lump in her breast. She was diagnosed with breast cancer at stage two. So what did they do? Went and got married and started treatment. The surgery followed pretty quickly and then the chemotherapy. My mom went through chemotherapy many years ago, so I know how awful it makes you feel. You loose all your hair. No appetite. No energy. Luckily, Duncan and Rodene Jones are fighting this battle together. Duncan and Rodene shaved their heads together in preparation for her chemotherapy treatments. The picture above is one that Duncan Jones tweeted (I believe). I found it in this article: David Bowie's son Duncan Jones weds Rodene Ronqillo after she was diagnosed with breast cancer. It is quite informative. In addition to supporting one another and Duncan Jones supporting his wife, they banned together to raise money for breast cancer research. Here is a link to their page where they are raising $11,612 (they found the lump and got married 11/6/12, get it? ): Duncan and Rodene Jones Fundraising Page. You can read the little, touching things that they posted. I highly recommend checking it out. If you can manage, please donate! It's for a good cause!